"Put that girl in the Witches Protection Program!" Conjurer Ichabod had returned. He had listened to the end of Red Vex's story before landing next to the table. "How are you, Gris? Much recovered?" asked Ichabod stuffing his face with fruit. "And how are your loyal subjects?" asked Dolt pointedly. "Adoring as ever," said Ichabod. "You know, history shows that the stupider the subjects, the more successful the ruler. I think this Lord of the Cows thing really has legs." "So," asked Solo, "Did you go back up to the pasture?" "Yeah, had to put down another Zerg incursion. They just don't seem to get it," said Ichabod. Red Vex moved closer to him. "Surely a man of your unmatched power should be able to sweep the land clean of the aliens," she purred. The visor came down. "AWAY VILE TEMPTRESS," boomed CowLord, "YOU SHALL NOT TAINT THE PURITY OF ESSENCE OF COWLORD!" Red Vex backed off. She had been hoping to coax a little more information out of the conjurer. Obviously, he required a more subtle approach. "Red Vex raised a good point," said Solo, "Can you defeat the Zerg? Are you the one thing that the Zerg fear?" CowLord hesitated. He started to raise his visor and then lowered it again. He opened a Horadrim Portal, then closed it again. Finally, he raised his visor. "No one man is a match for the might of the swarm," said Ichabod. "They've already overrun all of Khanduras and are headed toward the Westmarch border." The news sank in. Only Red Vex seemed to brighten. She started to say something, but Dolt spoke first. "There are several keeps between here and the border, many with magical and military defenses," said Dolt. "Were," corrected Ichabod. "They didn't stand a chance." "If you can't stop them, you've got to tell us what can," insisted Solo. "Look, I really can't talk about it now. I'm still having issues," said Ichabod. "But I'll give you a hint: It rhymes with... ahhhh... schmoojum." "Ichabod," pleaded Griswold, "If ye've got..."
"You will talk, little man," snarled Dolt, "Or I will rip you out of that armor in pieces and eat the pieces!" Dolt was fed up. He did not like people. He liked sorcerers even less. He decided he liked Conjurer Ichabod or CowLord, or whoever he was, least of all. He sprang like a cat, and the skinning knife he kept in his boot was at Ichabod's throat. "You will talk, little man," snarled Dolt, "Or I will rip you out of that armor in pieces and eat the pieces!" There was no question that the Barbarian was utterly serious. "The Boojum! The Boojum!" shouted Ichabod. "The Zerg are afraid of the Boojum!" Dolt let go of the sorcerer, and shot an unveiled 'I told you so' glance at Solo. "When was the last time you changed your armor?" grumbled Ichabod. "Talk about B.O." If Solo was chagrined that Dolt's method of information extraction had produced results, she did not let it show. "So, what's the Boojum?" she asked. Ichabod sighed. "There is a balance to the universe," he began. "There are things that belong and things that don't. The Zerg are definitely in Column B. Frankly, I'm at a loss to explain why the whole swarm didn't simply lag out days ago." Ichabod paused. The blank expressions on the faces of his audience reminded him of his loyal subjects. "Let me try it this way," said Ichabod turning to Griswold. "You've forged a few suits of armor in your day. What's the Armorer's Holy Grail? What would be the equivalent of transmuting lead into gold for an armor smith? Hitting 70 home runs in a..." He decided to quit while he was ahead. "Tha's easy," answered Griswold, getting the general gist if not the references. "Godly Plate of the Whale." "Even when someone has the skill, finances and raw materials to make one, what usually happens?" asked Ichabod. "It's unstable," said Griswold. "It disappears, usually after a few seconds. The only one in existence is on display at the University of Runestaff School of Sorcery. They keep it in a magical stasis field. It toured with Caravan when I was a wee lad." "The most sought after class of magic armor in the world," said Ichabod. "There's nothing wrong with the enchantments involved. They use the hardest metals known to anyone, yet they just keep evaporating. What makes that happen?" "Well..." Griswold realized he was stumped. He knew it couldn't be done, but not the reason why. Theoretically, anyone with the skill and the incredible amount of money that the materials would cost could forge one. Hell, given time, skill and money, you could outfit an entire army. "It's like my Grandfather Montgomery Griswold always used t'say," said Griswold finally, "Y'canna change the laws of magic." "Actually," replied Ichabod, "you can. I'm living proof. But you didn't answer my question. What makes GPOW disappear? I'll tell you what does it: It's the Boojum." "So what's a Boojum?" asked Solo for the second time. "When I first encountered it, I thought it was just a monster," said Ichabod, "But it's much more than that. Which brings us back to where we started. Certain things and a few people simply do not belong in this universe. They upset the natural balance. The Boojum is the force that removes them. The Zerg don't belong and they know it, that's why they fear the Boojum." "And you fear it because you don't belong either," guessed Dolt. The visor slammed down with blinding speed. "COWLORD FEARS NOTHING!" "Then it falls to you to stop the Zerg invasion," said Solo pointedly. The visor came part way up and then fell again. "THE SERVICES OF THE DIVINE BOVINE DO NOT COME CHEAPLY." "You must agree to be my Cow-Bride!" "Name your price," returned Solo. "If that's what it takes," replied Solo evenly. The idea of being introduced at functions as CowLady appealed to her not at all, but she wasn't going to let him know that. The visor came up. "I'm not ready to settle down yet," admitted Ichabod. "Will y'help Tristram in 'er time of need?" asked Griswold. "Tristram's time of need is long past, but I get your meaning. I was hoping the Zerg would just go away by themselves, but for some reason, that's not happening," sighed Ichabod. "I have an idea, but it's dangerous." "I have a dangerous idea too," volunteered Red Vex. She had been sitting quietly with a thoughtful expression on her face while Ichabod was speaking. "You said no man can stand against the Zerg. I know a demon who could. I can't believe I didn't think of this sooner. We're practically on top of him." She turned to Griswold. "One of the Prime Evils has been imprisoned beneath your town for centuries. That was the cause of all your troubles before the Zerg showed up." "Saaay," said Ichabod brightening. "That is a dangerous idea. Not as dangerous as mine, but it just might work. You think we could sic Diablo on the Zerg?" "Diablo?!" said Solo and Griswold together. "D'you mean the Lord of Terror's been livin' beneath Tristram?" asked Griswold. Red Vex nodded. "Black Jade and I were sent to Tristram to help secure a host body for him and prepare for his liberation." Dolt had not gone to church much growing up and knew little about Diablo or the Prime Evils. Demons were demons as far as he was concerned. What bothered him was the idea of letting one loose that might be a threat to the Zerg. If he was powerful enough to destroy the invaders, then who or what would have a hope of standing against him afterwards? "So releasing this Diablo is better than the Zerg," said Dolt doubtfully. "I can't promise that," admitted Red Vex. "He might blast us all to ashes the second he lays eyes on us, me included. But frankly, he's the devil we know, so to speak. Or, at least, the devil I know." "And that's what worries me," said Dolt. "You've already pretty much promised us that nothing good comes of anything you do." "Look at it this way," suggested Red Vex. "We were going to release him anyway. At least this way, there's a chance you and humanity will benefit, and even if you don't, you're no worse off under Diablo than you were under the Zerg." "Red Vex may be evil and treacherous, but the sorcerer is nuttier than one of my mother's Yuletide cakes. I'll take my chances with Diablo over that any day." "Well, we could try my plan," said Conjurer Ichabod. "Let's see, we'll need the Bovine Plate and some Aerosmith tickets..."
"We'll try the demon's plan," said Dolt. Later, when Solo asked him what changed his mind, Dolt replied, "Red Vex may be evil and treacherous, but the sorcerer is nuttier than one of my mother's Yuletide cakes. I'll take my chances with Diablo over that any day." Red Vex quickly outlined where they'd need to go and what they'd need to do in the labyrinth under Tristram. "Lazarus controls access to the portal leading to the level where Diablo is imprisoned," she explained. "It's a mystic pentacle that the Horadrim created to keep him in. We've been maintaining it to keep heroes..." She nodded at Dolt. "...out while he regained his strength. I doubt the Zerg could have gotten past it." Ichabod had excused himself early into Red Vex's briefing and went into the cottage. He came out several minutes later followed by a pair of Minotaurs carrying armor and an assortment of odds and ends. "Let's see," said Ichabod, "Who's in need of an upgrade? What kind of armor are you wearing, Dolt?" "Grand Scale Mail of the Wolf," replied the Barbarian with some pride. He had single-handedly put down a whole nest of sand demons to win that armor. "That is so Level Ten," said the Conjurer disdainfully. "Why don't you step into some real armor, little man." One of the Minotaurs presented Dolt with a suit of Holstein-patterned plate armor. Dolt took one look at the Bovine Plate, particularly the giant pink udder protruding from the belly, and passed. "I'd rather eat brown runes," he said grimly. "That can be arranged," replied Ichabod. "But if you're not secure enough in your masculinity to wear the Bovine Plate, then that's your loss. How about you, Gris? I know that gothic plate's been in your family for ages, but you're really going to need something tougher that will provide a little fire, lightning and magic resistance." Griswold looked at the armor critically. It was forged of pure mananite and as hard as any metal he had ever worked with. There was a good chance that it was indestructible. However, he had never seen such fine materials wasted on such poor workmanship. "Look," said Ichabod after Griswold had shared his analysis of the armor. "It's indestructible, AC 150, plus 30 percent resistance to fire, lightning and magic. And, it's one hundred percent legit." "Ichabod," wondered Griswold, "how is it that each thing y'say makes less sense 'n th'last thing y'said?" "You should talk," retorted Ichabod, "Every time you speak, I expect you to say, 'Captain, me engines canna stand th' strain much longer!'" "That made less sense than anything you've said so far," Solo pointed out. "Anyway, aesthetics aside, the Bovine Plate is the hardest armor you're likely to find," said Ichabod. "Aye, and it also drains the wearer's Mana and glows like a bonfire," said Griswold. "It's not like you use the Mana for anything anyway. Put the armor on and stop being such a snob. You'll need the extra protection where we're going," argued Ichabod. Griswold finally relented and put the Bovine Plate on. "Where did ye get this anyway?" "Farmer Lester traded it to me for a conjuration I performed a few months ago," said Ichabod. "Don't ask me where he got it." He turned to Dolt. "I have a suit of armor that may appeal to you." The armor that the Minotaur dragged over to Dolt was unlike anything any of them had ever seen. Even Griswold would not have known quite how to describe it. Dolt climbed into it rather than donned it. A Minotaur helped secure him in the armor and it closed around him with a series of hums and reptilian hisses. In the armor, Dolt stood nearly as tall as Ichabod in his CowLord armor. "It's the armor of the Zergs' traditional enemies," explained Ichabod, "Marine armor of the Firebat!" Dolt found that, despite its enormous bulk, the armor was weightless once he was in it. If anything, it made him stronger and faster. The visor was made of some sort of unbreakable glass and allowed him to see in the dark. Every so often, strange multi-colored runes would flash across the inside of the visor. "If you need to drink a potion," Ichabod told him, "Say 'Activate Stim Pack 1.' If you need to drink another one, say 'Activate Stim Pack 2' and so on. You have six healing potions in there with you." "What's a Stim Pack?" asked Dolt. "It's not important. Finally, be careful who you point at," warned Ichabod. "Those blackened nozzles on the backs of your wrists are flame throwers." He tried to put it into a context that the others would understand. "Think of it as a Staff of Flame Wave on each arm with 150 charges apiece." "How does he recharge them?" asked Solo. "Stand in the sun for an hour," replied Ichabod. 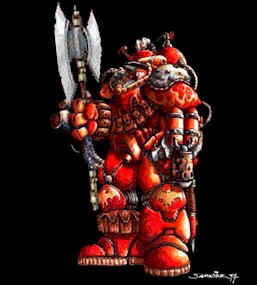 Dolt nodded inside the domed helmet as he picked up his axe. "It'll do."